James K. Polk is considered by historians to be the last strong pre-Civil War president. In his one term, he nearly doubled the territory of the United States, strengthened the economic power of the federal government, promoted trade, and bolstered the power of the chief executive. While nearly all give him credit for greatly strengthening the nation, he is often criticized for his lack of a forward-looking vision on the issue of slavery. The sectional disputes which would later tear the nation apart became more apparent during the 1848 Christmas season. Polk spent his time dealing with these issues and makes no mention of sending White House Christmas cards. On December 11th, Illinois Senator Stephen Douglas introduced a bill calling for all territories recently acquired from Mexico to be organized into a single state with the popular will deciding the fate of slavery. This outraged southerners who wanted the territory split, leading to representation of a greater number of slave states in the senate as well as many northerners, who did not want to permit slavery in any of the newly acquired territories. Two days later, an alternate bill introduced in the House of Representatives called for the admission of California and New Mexico territories as separate free states. A few days before Christmas, Representative Daniel Gott, a Whig from New York, offered a resolution condemning the slave trade in Washington D.C., further aggrieving southern politicians. The resolution passed 98-88. In his diary, President Polk writes of calling a pre-Christmas meeting to allay the fears of these representatives. Three days before the holiday, Polk, like many of the “moderate” statesmen of the early abolitionist period, writes in his diary that he viewed the politicians and activists of the growing antislavery movement as “mischievous & wicked,” not patriotic but only hoping to “promote their own prospects for political promotion.” He fumes that they did so at the peril of “disturbing the harmony if not dissolving the Union itself.” On the day before Christmas Eve, he writes of meeting with South Carolina Senator Butler and assuring him that he would support organizing the formerly-Mexican territories into at least two states and not ruling out the possibility of allowing slavery in the southern portion of the region. On Christmas Day, Polk writes nothing in regards to any sort of celebration, spending the holiday as a leisurely day off from work and calling it “perhaps the most quiet day of my Presidential term.” He mentions that Mrs. Polk and the children attended church but it seems that he did not accompany them. His presidential diary entries for previous Christmases also fail to mention the distribution of White House Christmas cards and reflect similar low-key activities. The day after Christmas, he writes of meeting with Senator Douglas and convincing him to allow the Mexican-ceded territories to be split and to table the question of the expansion of slavery for the time being. Polk spent the remainder of Christmas week modifying recently enacted laws regarding how the U.S. would collect duties on merchandise imported into Mexican ports under American control as a result of the recent war. 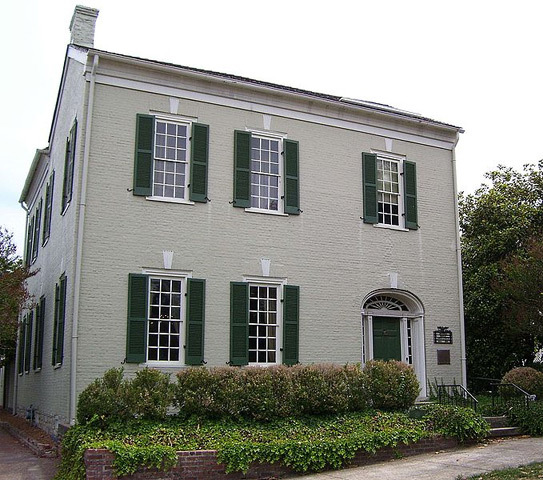 The Columbia, Tennesse home of James K. Polk, where he celebrated many Christmas holidays before moving into the White House. In the mid 1820s, Polk befriended fellow Tennessean Andrew Jackson and helped Jackson win election to the U.S. Senate. He married Sarah Childress, whose intelligence, personal charm, and presence would make her a politically influential wife and great asset to her husband. 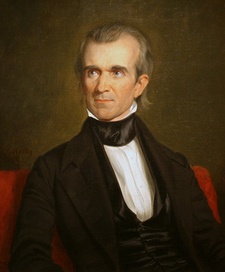 Polk was then elected to the House of Representatives, representing the 6th District of Tennessee. Under President Jackson, he was elevated to Speaker of the House where he supported Jackson in his Bank War, a dispute between the President and the Second Bank of the United States. He left the speakership to become Governor of Tennessee in 1839. After narrowly losing two re-election bids, Polk traveled to the 1844 Democratic convention. With well-known Democrats such as former president Martin Van Buren, Lewis Cass, and James Buchanan commanding the most attention, Polk set his sights on the vice presidential nomination. He separated himself from the major candidates by strongly supporting westward expansion, both in the North and South (to appease both pro-slavery and free-soil supporting expansionists). This position was advocated by Polk’s old friend, Andrew Jackson, who began pushing his former colleague for the top spot on the ticket. After the convention remained deadlocked through the first eight ballots, Polk became the nation’s first “dark-horse” candidate to win nomination on the ninth. He went on to defeat Whig candidate Henry Clay in a closely-contested general election. For his presidency, Polk set four clear priorities: the re-establishment of the Independent Treasury System (in which government funds were held in the federal treasury rather than private banks), the reduction of protective tariffs, acquisition of some or all of the Oregon country (which Great Britain also claimed), and the acquisition of California and New Mexico from Mexico. Polk accomplished the first two fiscal goals before the middle of his term. These policies were popular in the South and West, but not in Pennsylvania and much of the northeast. His first foreign policy victory came four days after Christmas of 1845, when Texas was admitted to the Union as the 28th state. This angered Mexico, which viewed the area as its own breakaway province. Avoiding a costly war, Polk reached an agreement with Great Britain to recognize the 49th parallel as the border between British Canada and the U.S., acquiring slightly more than half of the Oregon territory in the process. Acquisition of California and New Mexico would prove more difficult as the Mexican government refused Polk’s $20-30 million offer for the territories and by the spring of 1846, the nations would find themselves at war. It is certain that Mexican leader Antonio López de Santa Anna did not receive Christmas greetings from the White House. The country expanded again when Iowa gained statehood three days after Christmas. Another important event in American history occurred about a week after the holiday season when The Philanthropist became The National Era, and declared itself the country’s leading anti-slavery periodical. A few years later, Harriet Beecher Stowe’s highly-influential novel, Uncle Tom’s Cabin, would first be published as a 40-week serial in The National Era, further stoking the abolitionist movement. A few weeks before Christmas of 1847, another influential anti-slavery publication first rolled off the presses when former slave Frederick Douglass published the North Star. On the war front, General Zachary Taylor won a series of crucial victories against the Mexican forces, eventually occupying the capital, Mexico City, in late 1847. This led to the Treaty of Guadalupe-Hidalgo, signed in 1848, in which the Mexican government gave up any claim to Texas and ceded over half of its territory to the United States for a sum of $15 million. The area secured by the U.S. included California and much of the southwest. The acquisition of California had become even more attractive since the discovery of gold at Sutters Mill several weeks after Christmas 1847, followed by the ensuing rush of settlers to the western territory. With all of his primary goals accomplished and suffering from weak health, Polk decided not to run for re-election in 1848. He would not have much time to enjoy his historic achievements as he died from cholera on June 15, 1849 at the age of 53. His 103-day post-presidency is the shortest in U.S. history. I’m amazed that a president with such a remarkable record of accomplishment is not so well-known. Polk had it all figured out. Do everything you can & get out while you’re on top. I had no idea that President Polk did so much for this country; he is an unsung hero. Unfortuately for the country he was in ill health and could not continue his dedicated work.